Our Lamb Formula features a clean, low fat protein that helps your dog build strong muscles while keeping their weight at an optimal, healthy level. Along with an assortment of essential vitamins and minerals, our Lamb Formula provides your dogs with the nutrition they need to be healthy, strong, and full of positive energy. Our recipes are always grain free and chicken free to keep food sensitivity and allergies at a minimum. Your dog will also love the taste. Zignature® Lamb Formula – Learned from Nature, Crafted to Perfection. 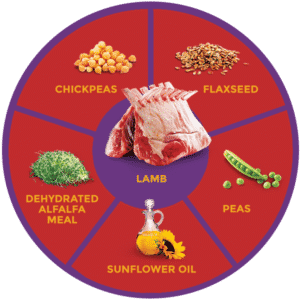 Lamb, Lamb Broth, Lamb Liver, Peas, Carrots, Chickpeas, Lamb Meal, Calcium Carbonate, Agar-Agar, Choline Chloride, Salt, Sun-Cured Alfalfa Meal, Potassium Chloride, Dicalcium Phosphate, Cranberries, Blueberries, Minerals (Zinc Proteinate, Iron Proteinate, Copper Proteinate, Manganese Proteinate, Sodium Selenite, Calcium Iodate), Vitamins (Vitamin E Supplement, Thiamine Mononitrate, Niacin Supplement, Calcium Pantothenate, Biotin, Vitamin A Supplement, Riboflavin Supplement, Vitamin B12 Supplement, Pyridoxine Hydrochloride, Vitamin D3 Supplement, Folic Acid) L-Carnitine.